Do you have a sump pump in your home? You may, or you may not, depending on the area in which you live. If you’re in an area where flooding is likely, the water table is high, or where rapidly melting snow or sudden heavy rainstorms are common, chances are you have one in your home. It doesn’t take much water to cause thousands of dollars of damage, and if you have a damp basement, mold can be a serious problem. A good sump pump can be worth its weight in gold. In some places, these pumps are a requirement and are installed in all new homes. 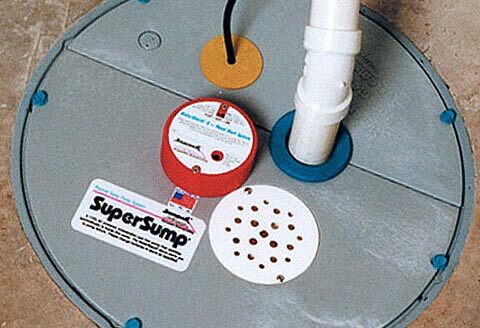 Sump pumps, as the name implies, are pumps located in your basement or crawlspace, and are designed to prevent excess rain or ground water from entering the house. While there are portable versions, most residential sump pumps are installed in pits, called sump pits, and help to keep your basement dry by pumping the water out of the pit, away from your house. This Old House has a great video showing a sump pump installation. A sump pump is a normally installed in the lowest part of your basement, or in a crawlspace. A hole is cut in the concrete floor, and the pump is placed in the sump pit (sometimes called a sump basin), which is normally 2 feet deep and 18 inches across. A pipe is attached, which then runs up, and out of the house, and releases the water several feet away from the foundation. The pipe usually has a “check valve” which prevents water from flowing back into the pit. When there is a flood, excess rainfall, or water from rapidly melting snow, instead of leaking into your house through any tiny cracks, it flows into the sump pit. Sump pumps are activated by a float, similar to the one in your toilet tank. When the water in the pit causes the float to rise to a certain level, the pump is activated. Most pumps have a fan-like device, or impeller, which spins once the pump is activated. This uses centrifugal force to push the water out through the pipe. Sump pumps require electricity to operate, and because they’re always either in water or very near water, the outlet should have a ground fault circuit interrupter (GFCI). Also, because electricity often goes out during a heavy rainstorm, it’s highly recommended that you also have a battery operated pump as a back-up. If the power goes out, and the pit begins to fill with water, the battery-powered back-up pump will automatically start operating. Take a look at the City of Edmonton’s Sump pump guide. What should you do when something goes wrong? Power outage: If the power goes out, your pump will be unable to do its job, and hopefully, you have a battery operated pump ready to take over. Debris in the pump: Sump pits can fill with debris, especially if it’s an open pit without a solid lid. If too much dirt or debris gets into the pump itself, the system will not operate properly, and may even shut down completely. Or a switch could get stuck in the On position, and fail to shut off, causing the motor to burn out. Regular maintenance is required to keep your system clean. Clogged or frozen discharge lines: These can cause the system to fail as well. It’s best to contact a professional in this situation. There are systems available that can prevent the pipes from freezing. You may also want to consider adding a vented cover to the end of the discharge pipe to prevent mice or other rodents from climbing in and clogging the system. Pit or Pump is the wrong size: If the sump pit is too small, and fills up with water too quickly, your pump may have to work harder to keep up, causing problems with the system. If the pump is too small, it won’t be able to pump the water out quickly enough. An important consideration, when determining the size of sump pump you need, is the horsepower of the motor, as opposed to the size of your basement. If your home’s foundation is below the water table, you may need to look at a pump with a more powerful motor. However, if you have a pump that is too large, the pump will cycle faster than needed and will shorten its lifespan. Missing or broken check valve: If there is no check valve on the pipe leading out of the home, or if the check valve is broken, water may not properly cycle out of the discharge line. Sump pumps are installed below grade, so the discharge line has to go up before it can go out, at which point it is directed downwards where gravity can take over allowing the water to run away from the home. Any water running back into the pit causes the pump to work overtime putting extra strain on the motor. This is where a properly operating check valve comes into play. Improper connections to sanitary sewers: Sewer systems are not designed to handle large volumes of runoff resulting from heavy rain or snowmelt. If your home’s sump pump is connected to the sewer, you may be at risk of contributing to an overload of the system, which can cause sewer backups. This connection may also provide an additional point of ingress for sewer backups into your home. You may want to consider disconnecting your pump from the sewer system. If you’re testing your sump pump, and can’t get it to turn on, make sure it hasn’t just come unplugged, or that a circuit breaker hasn’t tripped. Unplug the pump and plug another electronic device into it, to make sure the outlet is working. If the outlet’s working, but the pump is not, check the owner’s manual. You may need to reset the switch on the motor. The best thing to do to prevent these problems from happening, is to make sure your sump pump is properly maintained. What can you do to maintain your sump pump? Sump pumps need to be serviced in order to clean out dirt, sand, and other debris that are carried into the pit by water. If they build up, they will damage your pump. Most homeowners find out the hard way that their pump isn’t operating, when the basement is full of water, and they can’t even get near the clogged pump. Check the GFCI (ground fault circuit interrupter) outlet to make sure it’s plugged in, and the cord is still in good shape. If there is quite a bit of moisture in the area, the GFCI breaker may trip, causing the sump pump to shut down. If so, you’ll need to reset the GFCI. Make sure the pump has not fallen over, or isn’t leaning to one side as a result of vibrations during operation. If the pump is not sitting upright, the float arm can become jammed. Check the pump and the switches to make sure they’re running smoothly. Clean out any debris that has entered the sump pump liner. Test the battery back-up pump to make sure it’s properly charged. Check the sump pump alarm’s battery. Conduct a flood test to make sure the whole system is working properly. Check the discharge line outside for clogs. What is the life expectancy of a sump pump? Most pumps will last around 10 years, however the life expectancy is affected by the acidity and dirtiness of the water in the area. What will your home insurance provider want to know? Get an online home insurance quote and see how much money you can save by switching to Square One. Or, call 1.855.331.6933 for a phone quote. Either way, it only takes 5 minutes to get a personalized quote. Even when you take precautions, accidents can happen. Home insurance is one way to protect your family against financial losses from accidents. And, home insurance can start from as little as $10/month. Insurance is sold by Square One Insurance Services and underwritten by Pacific Specialty Insurance Company.